The Income Tax department launched e-facility to taxpayer to link Aadhaar and Permanent Account Number online for filing IT returns. PAN card and the Aadhaar card are unique identification cards. PAN card is necessary for filing the Income Tax returns for all individuals and entities who pay tax. If there is a mismatch in Aadhaar name provided, Aadhaar OTP will be required. 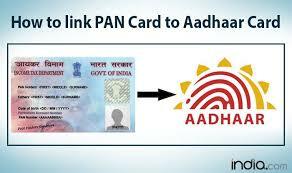 If Aadhaar name is completely different from name in PAN card, then the linking will fail and taxpayer will be prompted to change the name in either Aadhaar or PAN. Once you have updated all the above fields then HIT on Link Aadhaar Tab. After verification from Unique Identification Authority of India the linking will be confirmed.